Attention all you people who need to clean! Would you like to clean quickly? Would you like motivation and accountability? 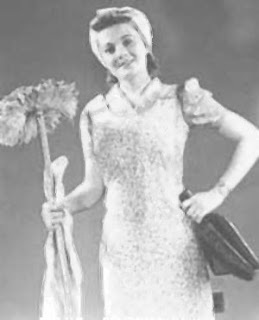 I have the solution for you - Cleaning with Mary! We meet on facebook chat on Thursday afternoons. We each set our timer for 20 minutes and then meet back on facebook chat after the 20 minutes are over. We report on what we have done in those 20 minutes. That means I actually have to do something in those 20 minutes. Then we set the timer again, come back, and report. After we are finished, we (or at least I ) find some chocolate somewhere. If you are someone who gets distracted easily with chores, this is a great motivational method of cleaning! You can't have Mary, she's mine, but find a friend and make cleaning fun and fast and chocolatey! Your deal wtih your girlfriend was my childhood. My mother always had us clean on Thursdays so the house was done for the weekend. It was worth the evening scramble. I go straight for the chocolate when we're done too! And I pat myself on the back for getting so much accomplished. Works great!